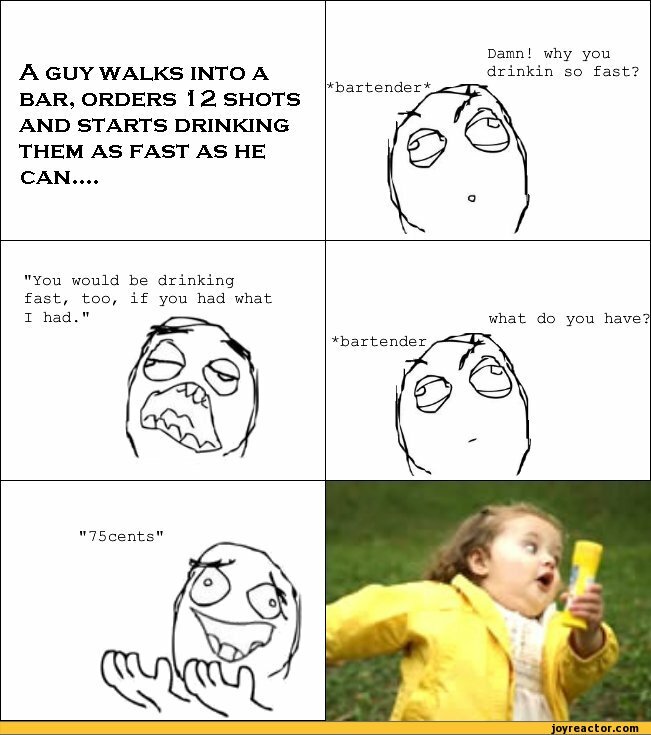 Details ﻿A GUY WALKS INTO A BAR, ORDERS 1 2 SHOTS AND STARTS DRINKING THEM AS FAST AS HE CAN.,, Damn! why you drinkin so fast? rbartender "You would be drinking fast, too, if you had what I had." what do you have? ^bartender "75cents"
﻿A GUY WALKS INTO A BAR, ORDERS 1 2 SHOTS AND STARTS DRINKING THEM AS FAST AS HE CAN.,, Damn! why you drinkin so fast? rbartender "You would be drinking fast, too, if you had what I had." what do you have? ^bartender "75cents"